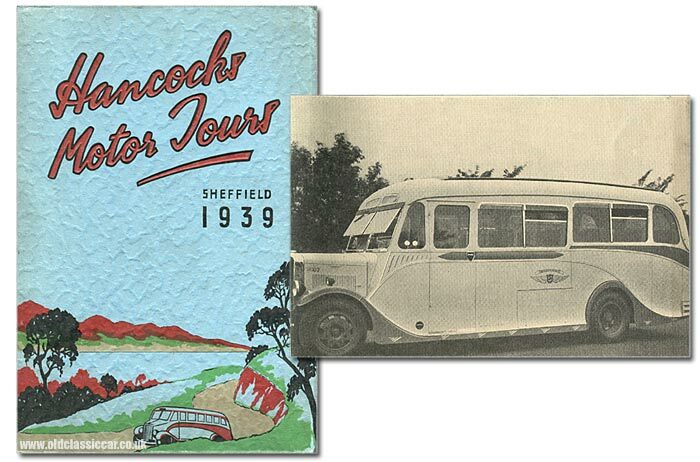 1930s coach trips with Hancock's Motor Tours of Sheffield. Homepage. This page: Motor coach tours around Britain in the months leading up to WW2. At first glance it appeared that Hancock's Motor Tours was closely related to United Motor Services (UMS), as both companies' literature list their proprietors as Sheffield United Tours Ltd. Coincidentally both catalogues were purchased together. A check online confirms that Sheffield United Tours Ltd was formed in 1935, drawing together the services of six, previously independent, coach operators, amongst them was Hancock's. While the UMS tours catalogue is relatively modest in size, that for Hancock's is a lavishly-produced publication and noticeably thicker. Vehicles liveried with the Hancock name would concentrate on extended holiday trips, it was reported in a 1930s copy of The Commercial Motor magazine. The catalogue shown here dates to the 1939 season, one that wouldn't end for the country as it had begun. 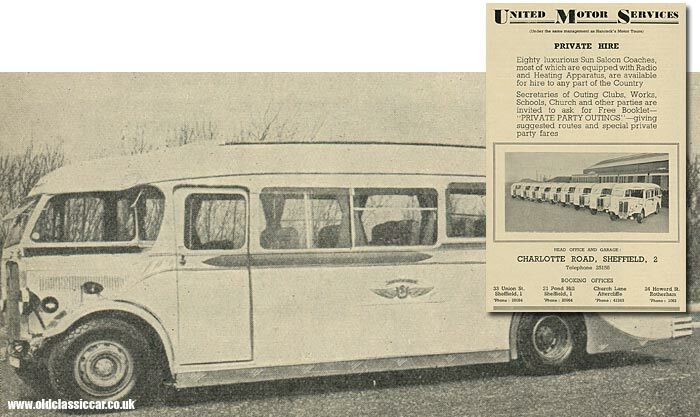 The cover features an illustration of a motor coach touring an idyllic lakeside location, while inside is a photograph of a company vehicle, fleet number S.97. Sources elsewhere confirm that number 97 was a Leyland KPZ2 of 1936, fitted with Burlingham C24F coachwork, registration BWJ 608. Both this and sister vehicle 98 would be conscripted by the Ministry of Supply in 1941 for war duties, a far cry from relaxed tours into the British countryside with a full complement of cheery passengers on board. The list of destinations, routes and prices would take hours to list out, suffice to say that anyone living in the Sheffield area, who was partial to "first class" hotels to go with their motor tour around Great Britain, had plenty of options to choose from in Hancock's 224-page tour book. Trips utilising only the best British hotels could last from three to twelve days, and ran throughout the year. In addition, a number of special autumnal tours were being planned, although I wonder how many of them actually took place given the events of September 1939. Three continental tour routes are also mentioned, one - ironically as it would turn out - being a trip to Paris, taking in the famous battlefields of the Great War. It was due to depart on September 30th 1939. "It is with a strong feeling of optimism that we offer in this booklet the programme of Hancock's Motor Tours arranged for 1939. The clouds which overshadowed this country, and indeed, the whole world at the end of last summer have now, to a large extent, disappeared and one can look forward with a mind free from anxiety to approaching holidays. After a somewhat disappointing summer last year, and an unusually rigorous winter, it may reasonably be expected that the summer of 1939 will be favoured with really good weather. "In spite of the disappointing weather experienced, and of the effect upon public confidence of the international situation, 1938 maintained the tradition of creating a record over the preceeding year for the number of passengers carried and the number of miles operated. "... One suggestion [following a customer questionnaire] which we would like to be in a position to adopt concerned the operation of tours to Ireland. Unfortunately, motor coaches in that country are operated by a Transport Board, which refuses to allow British coaches to be temporarily imported. United Motor Services also operated under the umbrella direction of Sheffield United Tours Ltd, as did Hancock's, and advertisements for the UMS private hire service appear within this guide. They were justifiably proud of their eighty "luxurious Sun Saloon Coaches", most of which benefited from "mod cons" such as radio, and a heater. A line-up of nine such vehicles are shown, along with details regarding how to make a booking. Elsewhere, there is a side view of a UMS coach, although in this instance there is no visible fleet number from which to establish the vehicle's identity. Sheffield United Tours Ltd, the parent company, would soldier on well into the 1960s. It would be merged into National Bus Company in 1969, the beginning of the end for this operator and its constituent parts. The name continued for a few more years, but by the mid-1970s had disappeared for good, only now surviving on a small number of preserved coaches.